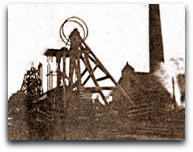 Shirland colliery (Derbyshire) sunk 1864-1865 by Beavan and Bailey, was closed in May 1965 after 100 years. Position: No1 UC shaft SK35NE, 439888, 358002. Highest manpower was 545 men in 1961 and highest tonnage 295,770 tons in 1957. The pit was situated to the north west of Alfreton at Hallfield Gate off the old Roman Road Rykneld Street. Position 43/3958/888002, 43/3958/897024, 400 ft (122m) above sea level. The shafts were sunk to Blackshale at 156 yards (143m). Horizontal winding engines, 2 cylinders 24” (0.61m) x 4 ft (1.22m) stroke x 12 ft (3.66m) drum. There was a single inlet Capel ventilation fan 12’6” (3.81m) dia x 6’ 0” (1.83m) wide. Underground there were 3 sets of rope driven pumps and three 3-throw electric ram pumps and 3 sets of pumps in the upcast shaft to the surface. Bucket pump 15” (0.38m) and plunger sets 14” (0.35m) and 13” (0.33m) dia worked by rods and quadrants from surface. 4 Clarke and Stevenson coal cutting machines in Deep Hard working a 4’6” (1.37m) undercut and one electrically driven Garforth cutter in Silkstone working 5’ 6” (1.68m) undercut. Main and tail rope haulage worked by engine on surface. 30 beehive ovens, making coke with coal from Low Main and Silkstone seams. The colliery was taken over by Shirland Colliery Co in 1866, Shirland Colliery Co, Benton and Woodiwiss from 1877, Blackwell Colliery Co from 1888, then by NH and B Collieries Ltd (New Hucknall and Blackwell) in 1944. Seams dip at about 1in8. Originally candles were used in the Tupton seam, with double gauzed bonneted safety lamps with flat wicks and using cozaline in other seams. Carbonite explosive was used, fired by electric battery. An Armstrong airbreaker method of shotfiring was introduced in Aug 1958. At that time the Deep Hard and Deep Soft seams were worked on conventional longwall advancing methods with an overburden of up to 200 yards (183m ) and as little as 25 yards (23.9m) and was naturally wet. Deep Soft faces cut with flat jibs and Deep Hard with double turret mushroom jibs. Pilot and reamer bits were used to drill the 3” app (0.08m) holes. After blowing down the coal on the turning shift it was handfilled onto face chain conveyors. The Compressed Air Blasting Shells Regulations, 1960 were applied to the system. 1946: 323 Deep Soft, Deep Hard, Low Main, 164 s/f. 1965/66: 23,234 tons, 102 men. Many old bell pits lie to the north of Shirland and there were several old deeper pits around plus old Upper Delves and Shirland Delves to the south. An old shaft was sunk 40 yards (36m) to the Hard coal. To the west beyond Hallfield Hall was the old Crabtree pit sunk 60 yards (55m) to Blackshale. There were 30 coke ovens at 11 ft dia (3.35m). 2 shafts at 14 ft dia (4.26m) were sunk 40 yards (36m) apart. Winding engines were made by Thornewill and Wareham. The South Yorkshire Miners’ Association (a Mr Dallas and a company of colliers) purchased the mine in 1875 for £72,000. Philip Casey a Union man was offered the post of Manager. However the venture failed and it was purchased by Benton and Woodiwiss (Railway contractors) in 1877 after being reopened by Mr Kympton in 1876. It was a naturally wet pit but water broke in during 1888 in quantity and the pit was stood for 16 weeks. A Davy pump was installed to pump the pit dry. Ventilation was by a fan at Hallfield Gate shaft which had been sunk as a ventilation shaft for West Shirland. 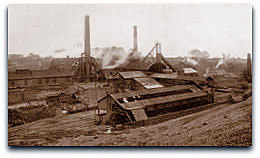 The pit was purchased by the Blackwell Colliery Co in 1890. Many miners resided at St Leonard’s Place. There was a Miners’ Welfare and a band was set up. The colliery then came under the amalgamation of New Hucknall Colliery Co and Blackwell Co, and formed part of NH and B Collieries Ltd before becoming a unit of No4 Area of the NCB in 1947. Jack L Merry Agent (542) –1946. Jack W Smalley (3722) 1957- . Colin Wells (6005) 1964-1965 (promoted from Deputy Manager Silverhill, transferred to Manager Silverhill). 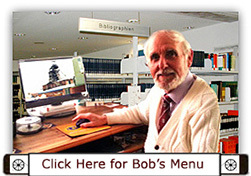 Gordon Ison (2633) 1953-1965 (appointed upon qualifying Jan 1953, transferred to Sutton on closure, 1965-1975, later Group / Senior Surveyor North Nottinghamshire Area 1975-1986). Coal turning finished May 1965 and the colliery was abandoned 24th March 1966. Thomas White (?) 24/4/1874 ? George Herbert Callin (23) fall of roof 1/1/1941.